Firefighters often put their lives at risk during operations, so it is essential they have reliable tools to help them do their job. Now, a modular simulation kit is set to help develop new information and communication technologies – and ensure they are tailored to firefighters’ needs from the outset. Chalk is used to mark which rooms have already been searched, but these markings are often difficult to see through the smoke. What is needed are new technologies such as sensor-based systems to support the emergency crews during operations where visibility is limited. But such systems, too, carry their own risks: having too much information to hand might confuse crews and be a hindrance. That is why researchers at the Fraunhofer Institute for Applied Information Technology FIT in Sankt Agustin have now developed a set of special simulation methods and tools. These will allow emergency services to test technologies in a realistic environment while they are still in the development phase, so they can tailor them to their specific requirements long before they are needed in earnest. It also gives crews the chance to get used to unfamiliar sources of information while on safe ground. The FireSim method kit is made up of four simulation modules. The first comprises a role-playing board game which emergency workers can use to play out operations. Players move around on a map of the emergency scene, and the new technologies are represented by special tokens. This allows crews to try out new ideas with a minimum of effort. The second module is like a computer game. Various firefighters each sit at a PC, and on the screen they see the emergency scene from a first-person perspective. The players move through virtual space, opening doors and rescuing the injured, and trying out virtual prototypes of novel support systems – such as sensor nodes that mark out the paths that have already been followed and which rooms have been searched. “These simulations allow us to make rapid changes to prototypes and put them to the test in complex deployment scenarios. Since we want to take the whole hierarchy into account, we recreate all communication and coordination processes in the simulation as far as we can,” says FIT project manager Markus Valle-Klann. 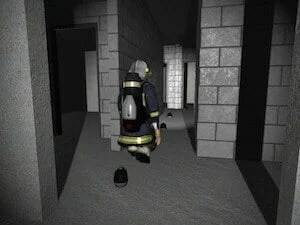 The third simulation module blends the virtual and the real, with emergency crews playing out a scenario in a real environment, for instance to rescue someone from a smoke-filled building. They carry with them a system that is integrated into their suit, such as a display in their helmet or on their arm, and provides details of their location and bearings. Meanwhile, a virtual simulation runs in parallel, with helpers reenacting all the emergency workers’ real actions. New technologies such as the sensor nodes are simulated and the results sent by radio to the firefighters’ displays. In this way, systems of which no physical prototype has yet been built can already be tested in a real environment. But to evaluate new technologies in a major fire event involving many emergency workers and bystanders, these methods will not suffice, so the researchers have developed a further module. “We take the behavior of individuals as our starting point. How does a firefighter behave, and how about members of the public? We convert these into behavioral models – or agents – and then a computer calculates how a major emergency operation will play out, taking these behavioral models into account,” explains Valle-Klann. Emergency workers can validate the results by taking part in these simulations. Some of them direct an avatar on a PC, while others move around in the real fire scene. The FIT researchers will be presenting the modular methods kit at the CeBIT trade fair in Hannover from March 6 -10, 2012 (Hall 9, Booth E 02).